Could new mobile phones come with crypto wallets installed as standard? If the recent leak from Samsung is anything to go by, it's certainly possible. Read about mobile crypto wallets and more in this week's news roundup. 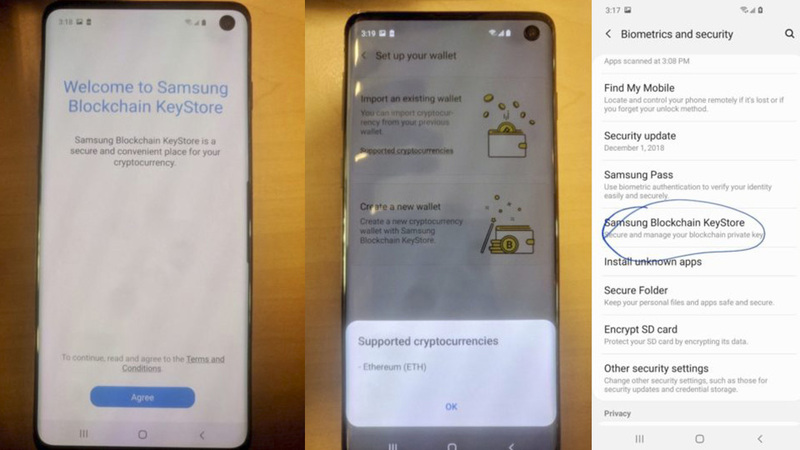 Leaked photos of the new Galaxy S10 smartphone surfaced, showing what appears to be a built-in cryptocurrency wallet. This leak is in line with three blockchain-related trademark applications Samsung submitted recently. The photos of the phone show a wallet along with the name "Samsung Blockchain KeyStore". Mainstream adoption depends on ease of use. A tech giant like Samsung making crypto wallets accessible to millions of potential investors is a big step forward. However, Samsung will need to ensure that security is tight with this new features. ABN AMRO, a Dutch bank, confirmed on social media last week that it is trialing a cryptocurrency storage option with 500 customers. This product will be known as Wallie, offering ABN AMRO customers the opportunity to store and manage their Bitcoin funds with the bank, alongside their fiat. Customers storing Bitcoin with ABN will not control their private keys. Instead, the bank has an insurance guarantee for any customer holding Bitcoin up to €6,000 with ABN. Last year, a hacker using the name "Nobertvdberg" created the website iotaseed.io, which was allegedly a random password/seed generator for iota, the popular DAG cryptocurrency. Analysis showed that the hacker was able to generate seeds for users of the website, but also securely store them. The hacker kept the website running from August 2017 until January 2018. He then began using the stored seeds to log in to wallets and steal funds. German authorities were able to track down the suspected hacker in the UK. The suspect was arrested in Oxford, UK. on January 23, 2019, for charges of theft, money laundering and fraud. In total the suspect is thought to have stolen €10 million worth of IOTA. EUROPOL have seized a number of computers and electrical goods, as well as drugs and cash. There were more than 85 victims worldwide. The Pennsylvania Department of Banking and Securities (DoBS) issued a report stating that states cryptocurrency exchanges and ATMs are not viewed as money transmission services in the eyes of the law. As such, the DoBS has stated that cryptocurrencies are not money. In the report, money is defined as “currency or legal tender or any other product that is generally recognized as a medium of exchange”. On the other hand, Wyoming has brought in new bills that bring some much needed clarity to crypto and blockchain. Ultimately, the bills are providing crypto the same status as money, allowing banks to offer crypto custodial services.